It's not a perfect fit, but Belgium are the closest thing we have to a true dark horse in this World Cup. They won't step onto the pitch as a mysterious bunch of kids in cleats—indeed, the whole reason they are so intriguing is because everyone expects these Belgians to be running things in a few years time—impossible to project, but they do arrive with scant international experience, hail from a country with little-to-no soccer pedigree, and yet the only shock should they find themselves in the Maracanã with a chance to win the whole thing would be that it all happened so soon. Belgium are nowhere near an international powerhouse. Their best international results consist of a fourth-place finish in the 1986 World Cup and finishing second in the 1980 Euros. Most recently, they haven't played in a World Cup since 2002 and haven't featured in the Euros since co-hosting the competition in 2000. That extended drought from international competition left the Belgian faithful a little ambivalent towards their national team. Until recently, that is. Because this team is dope. Like, really, really dope. Words like "golden generation" often get thrown around too often whenever a group of three or four promising youngsters hit the scene, but this overflow of young Belgian attackers certainly qualifies. The golden generation first announced their presence at the 2008 Olympics. There, the Belgian U-23 side featuring current senior team regulars like Vincent Kompany, Jan Vertonghen, Thomas Vermaelen, Marouane Fellaini, Mousa Dembélé, and Kevin Mirallas finished fourth. While that in itself might not be much to celebrate, that a group of young, gifted, exciting players had finally emerged from Belgium's schoolyards gave the country hope for better days ahead. Inject into that mix an even younger band of wonderkids like Eden Hazard, Kevin De Bruyne, Romelu Lukaku, and Christian Benteke, and you have what looks to be an inchoate international juggernaut. They looked the part in the lead up to the Cup, too. Despite failing to make the past two World Cups, as well as the two most recent Euro tournaments, Belgium flew through qualifying this time. In an admittedly not-that-tough group, they went undefeated with eight wins and two draws. There is a reason most bookies have Belgium at the top or near the top of the second-tier nations that could win it all, behind the prohibitive favorites of Brazil, Argentina, Spain, and Germany. Marc Wilmots is a Belgian legend. As a player he was selected for four World Cups, captaining the country in his final tournament in 2002. His 29 international goals are only one shy of the Belgian all-time record and the five he scored in World Cup play are the most in Belgium's history. After retiring from the game, he won a seat in Belgium's senate, though his messy resignation was apparently somewhat scandalous. All together, he's pretty much Captain Belgium. This isn't a small thing in the country. Belgium is a nation divided, mostly along language lines. Different areas of the country use either Flemish, French, or German as their primary tongue. These cultural squabbles manifest themselves in the politics of Belgium, as well. Brussels may be the headquarters of the EU, but Belgium is far from copacetic with its own cultural diversity. The Flemish and Walloons are always in political struggles of some sort. Which is why this team is so important to the nation. An old saying goes that only two things hold Belgium together: the royal family and the Red Devils. No matter what language you speak, seeing guys in your nation's colors put a couple goals past France will cause even the most strident Flem to fistbump his French-speaking neighbor. However, the team itself from time to time has fractured along cultural lines, and there are even long-standing rumors that the selection process is subject to a quota system, mandating a certain number of players representing the different languages of Belgium. You could see, then, how all of this infighting and rumor-mongering can frustrate Belgian citizens, eventually causing them to throw their hands up with the Red Devils. That Wilmots—and captain Kompany, for that matter—is fluent in both French and Flemish and is seen as unifying figure is a boon for both the national interest and the different factions among the players. With apologies to this tournament's hometown hero Neymar, Eden Hazard is the best young player in the world. Before the samba boys get too defensive, Neymar still has all the potential in the world. It's just that Hazard is one step further on the developmental curve than Neymar. The Brazilian is right now like Hazard was his first year in England, showing flashes of why he is so fawned over. Hazard no longer merely flashes brilliance, he is already a superstar, the cornerstone of Chelsea's attack. Neymar will get there. (Probably.) At only 23, he's the best player on the Premier League's third-place team, the first name on the opposition's whiteboard when a European team meets Chelsea in the Champions League. Hazard is all set up to be the next Cristiano Ronaldo, a wide-playing goal scorer who breaks down the heart of the defense with his super-elite dribbling. The way he effortlessly chops his way from the wing to the penalty box, and either backheels an audacious pass for a teammate to finish or curls in a goal himself makes him the one Belgian you want to make a point to stare at. Which shouldn't be hard, given that Belgium will undoubtedly play through their best player. If he gets his way, though, he might be playing more centrally. He's made his feelings known to his coach that he'd like to play as the number 10, the role he thrived in when at Lille. Anything that gets Hazard the ball in more dangerous positions can only be a good thing. If Belgium succeed in this tournament, we'll see a lot of Hazard cutting inside, eeling his way through the defense, then taking a crack from just outside of the box. His end of tournament highlight video will get at least a couple hundred thousand views, so you may as well see it all play out live. As young as Belgium already are, Lukaku will not only be the youngest starter but also the youngest Belgian on the whole team. Not that you could tell from looking at him. The 21-year-old Chelsea player (though he's spent the past two seasons on loan at West Brom and Everton) stands at a towering 6-foot-3 and 220. Lukaku plays every inch of his size. He's the prototypical target man, adept at plucking long balls out of the air with his deft touch and holding up the play until his other attackers can join in. From there he'll press the back shoulder of the central defenders, eager to latch on to a through ball to see him in on goal. But he's not as limited as traditional target men tend to be. He's actually a good dribbler, can pick the incisive pass, and scores from distance, too, not only those poacher knock ins. His all-around game is the difference between the striker Lukaku replaced at Everton, Nikica Jelavic, and a player whose future lies with one of the best clubs in the world. In a strange way, Belgium are both very attacking and very defensive. This is a result of playing six attack-minded midfielders and forwards along with four center backs in defense. We'll likely see the Red Devils employ a 4-2-3-1 formation to maximize the country's absurd depth in attacking midfield. However, they can also seamlessly switch to a 4-3-3 should they want to play a little more cautiously. And I do mean only a little more cautiously. As long as the front 6 is comprised of the expected players, Belgium will be an attacking side regardless. 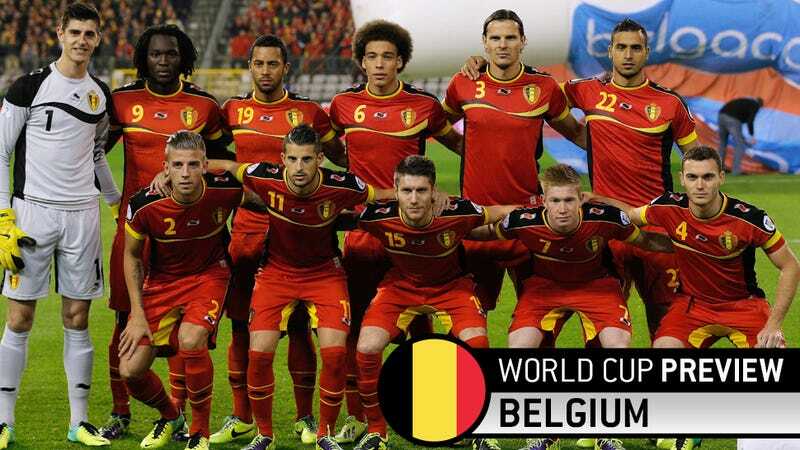 Belgium's offensive firepower rivals any nation on the planet. Eden Hazard on one flank, Kevin De Bruyne on the other, Romelu Lukaku up top, and Nacer Chadli in behind is an attack the best club teams in the world would be happy to have. (Except Chelsea, that is, who at one point owned three of those guys, save Chadli, sold off De Bruyne, and have pretty well alienated Lukaku. It's not yet clear how wise that's been.) And that's just one possible iteration; the Red Devils have at least three other starting-caliber attacking mids they might field any given game. Their depth is absurd. Behind whatever four they start with furthest up the pitch, they will most likely be supported from deeper in midfield by—you guessed it—two more attack-minded players. ("Ultra-attacking," remember?) If Belgium want to put out their two best central midfielders, we will likely see Axel Witsel and Marouane Fellaini on the teamsheet. And while these guys are natural central mids who play similar deep roles at their clubs, they are both more comfortable going forward than staying back. Both players will drop back to collect the ball and start attacking moves with their visionary passing. They will also frequently make late runs into the box to provide an additional attacking option when play gets stretched. What they are not so intent on—though Fellaini has greatly improved this aspect of his game—is the conservative positioning and reading counter attacks that you'd usually like to see from at least one of your deeper midfielders. This in and of itself isn't a fundamental flaw. Two seasons ago, Real Madrid often played with Xabi Alonso and Luka Modric in the same position and neither of those players are as sound defensively as Fellaini is. Chelsea have too, when playing with Ramires and Frank Lampard. When you maintain possession and slice up defenses as well as Belgium can, you can get away without fielding a natural destroyer. So how is this team also ultra-defensive? It's because of their back four. Belgium's defense is nearly as deep as its offense, and a top-class defender or two will be forced on the bench, playing with their iPad during games. However, all their good defenders are center backs. In order to field their best defense, they play with four center backs, usually lining up Jan Vertonghen at left back and Toby Alderweireld on the right. Vertonghen and Alderweireld are both more than solid defensively and combine that with the athleticism and passing ability that prevents their forays as fullbacks from being disasters. Vertonghen, in fact, has often filled in at left back for his club Tottenham and even done so admirably. Alderweireld has been a late-game defensive sub for Atlético Madrid, the few times he managed to get minutes at all. But getting away with playing two really good center backs and thriving with them are two different things. Despite knowing that width will be a problem when the two wide players up the pitch aren't natural, touchline-hugging wingers—which is true of Hazard, De Bruyne, Chadli, Mirallas, pretty much any Belgian playing wide—Alderweireld and Vertonghen still don't get forward enough. Even with the famed Ajax Total Football training of their youth, it still has to feel unnatural indiscriminately bombing forward at any moment. So where the aforementioned Madrid side with Alonso and Modric and inverted wingers like Cristiano Ronaldo and Ángel di María fairly narrowly attacked down the center of the pitch, Marcelo and and Álvaro Arbeloa were always high and wide on the pitch, keeping the defense from completely collapsing inside. Again, this isn't necessarily a fatal flaw. Manager Wilmots had recently started trying to integrate Sébastien Pocognoli, a real full back, on the left. This would've at least give more width to the left side, and as Tottenham have shown with Vertonghen and Chelsea have shown with Branislav Ivanovic, playing three natural center backs is a much less of a problem than playing four can be. But then they left Pocognoli off the squad. And Belgium offensively are so potent that they could put three goals past an eleven-defender lineup, so it may not matter too much. Still, how the back four copes with both the defensive and attacking duties will have a large say in just how far Belgium get in the knockout stages.